The Jean Sibelius Quartet - Yoshiko Arai and Jukka Pohjola (violins), Teemu Kupiainen (viola) and Seppo Kimanen (cello) - was formed in 1980 and granted the right by the Sibelius estate to use the name of the Master of Ainola. The following year already brought invitations to appear at several Finnish and Swedish music festivals. Since making its international breakthrough at the West Berlin Music Festival in 1983, it has visited most parts of Europe, India, China, South Korea, Chile, Japan and the United States. 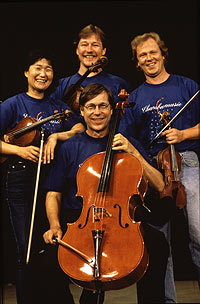 The Quartet was awarded a three-year grant by the Finnish state in 1985. In 1991 the Quartet won the prize of the Chilean music critics for the best performance by an international ensemble in Chile, and in 1998 the award of the international critics at the Cracow Contemporary Music Days. The Quartet has performed at the Kuhmo Chamber Music Festival every year since 1981 and undoubtedly ranks today among the most sought-after quartets in Scandinavia. Cellist Seppo Kimanen also acts as the Artistic Director of the Kuhmo Chamber Music Festival. The Quartet is equally at home with Haydn and Mozart as with contemporary composers and has collaborated with Sofia Gubaidulina, Aulis Sallinen, Einojuhani Rautavaara, Jouni Kaipainen, Erik Bergman, Haridas Greif and others. It has recorded a wealth of Finnish music, including string quartets by Sibelius (ODE 773-2) and the string quintet and two string quartets by Einojuhani Rautavaara (ODE 909-2).